The CareGiver Partnership: Does Your Loved One Need a Medical Alert System? Does Your Loved One Need a Medical Alert System? Will you be there when they fall? Will your loved one be able to access a phone when they fall? Will your loved one be cognizant enough to tell the EMT important medical information? If the answer to any of these questions is no, you need to learn more about how a medical alert system can provide the peace of mind that you and our loved ones need when a fall happens. Just a simple press of the large button in the center of the medical alert pendant or necklace and EMS can be immediately summoned to the scene. How do you know if your loved one needs a medical alert system? 1. Are you extremely worried about your loved one’s safety when you’re gone? 2. Is that fear preventing you from leaving the house to work or get basic errands done? 3. Has your loved one fallen, been seriously injured, or been in an emergency in the past year? 4. 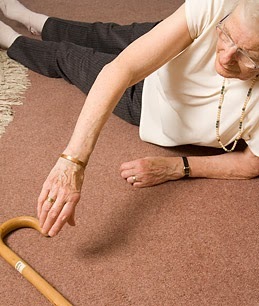 Do you believe that your loved one is prone to falling? Are they worried about falling? 6. Does your loved one take three or more medications in a day? Have you noticed any effects from those medications? 7. Does your loved one have any (or is at risk for) medical conditions like stroke, heart attack, diabetes, or arthritis? 8. Does your loved one have any issues with daily activities like going to the bathroom, bathing, or eating? 9. Due to circumstances, is your loved one left at home alone for many hours at a time? 10. Does your loved one find it easier to press a single button instead of finding small buttons on the telephone? If you answered ‘yes’ to three or more of these questions, there’s a high probability that getting a medical alert system would be highly useful in setting both you and your loved one at ease. Once you have made your assessment, it’s time to make a commitment to the decision that was made and find the medical alert system that’s right for you. Are Your Inflamed Bowels Causing ABL? Are Your Leaks Hemorrhoids Related?